DENVER — We’re getting closer to the day when black folk will have broken through so many barriers of institutional racism that there will be no need to highlight the first time another mountain is climbed. But we’re not there yet. So it’s noteworthy whenever African-Americans reach new heights — especially when two rise up together. Head coaches Vance Joseph of the Denver Broncos and Anthony Lynn of the Los Angeles Chargers, the first African-Americans to hold those teams’ positions, will be linked forever after the Broncos held on for a 24-21 victory Monday night. The game that completed the NFL’s opening-week schedule also marked the first time that two black coaches made their regular-season debuts with their NFL teams during the same game. On consecutive days last January, the friends and longtime assistant coaches (Lynn served as interim head coach for the Buffalo Bills’ final game last season) were picked to lead AFC West teams. As the league closed the book on Week 1, Joseph and Lynn began new chapters together. In the final quarter, Los Angeles mostly moved forward. The Chargers pulled to within 24-21 late and believed they had tied the score at 24-all on rookie kicker Younghoe Koo’s 44-yard field goal as time expired. As it turned out, Joseph had called a timeout just before the kick. Five seconds were put back on the clock, and the Chargers lined up for another field goal attempt. The second one wasn’t nearly as good as the first. Broncos defensive end Shelby Harris burst through the middle of the line and blocked the ball. Denver took possession with one second remaining and assembled in the victory formation, and quarterback Trevor Siemian kneeled to punctuate the first win of Joseph’s career. And as talented as the Broncos are, don’t be surprised if Joseph piles up a bunch of victories in his rookie year. The former Miami Dolphins defensive coordinator definitely did his part to secure his first one, players said, designing and implementing a sound game plan and managing the clock well. Although calling a timeout in an attempt to “ice” a kicker is a textbook move, players want to know that head coaches will make the right moves under pressure. It’s not uncommon for inexperienced head coaches to inexplicably use timeouts too early as they learn clock management. When Los Angeles lined up to potentially tie the score, Joseph had two timeouts remaining. “I wanted to leave those in my back pocket,” he said. On his first major test, Joseph aced it. Joseph was ready for the moment. He’s been preparing for it his entire career. “It felt like a preseason game, to be honest. It was just a game,” Joseph said. “Obviously, the game matters and the timeouts were more critical because it counts. 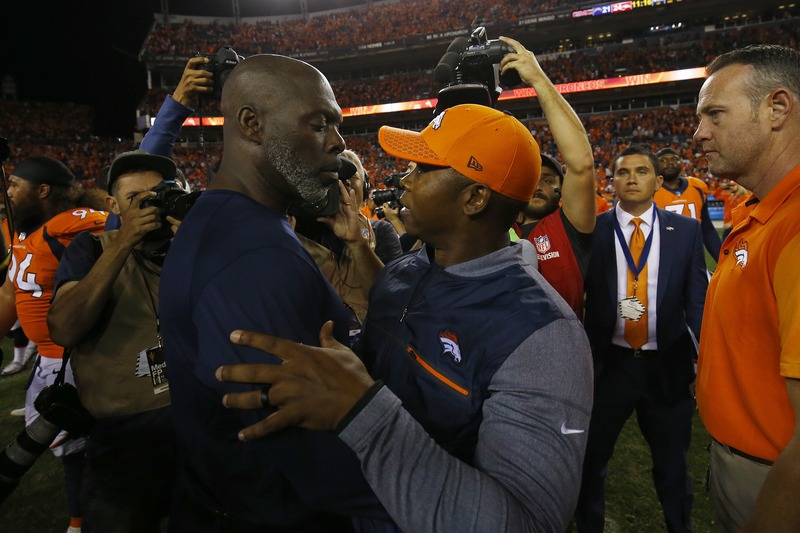 Head coach Vance Joseph of the Denver Broncos (right) talks with head coach Anthony Lynn of the Los Angeles Chargers after the Denver Broncos won the game at Sports Authority Field at Mile High on Sept. 11 in Denver. If the Chargers had made fewer mistakes early on, perhaps things would have turned out differently. Lynn knew it too. Of course, there can only be one winner. The Broncos are off to a good start because their new head coach is the right man for his job, star outside linebacker Von Miller said. Everything starts at the top. “The team is what our leadership is,” Miller said. “Coach V.J. … he did a great job with the culture of the locker room. He’s a great guy and a true leader who gets guys to follow him, not by what he’s saying but by the way he handles his business. I’m excited about this team, and I’m excited about our head coach. Over the next 16 weeks, the Broncos and Chargers will remain on the grind. Their first game is already in the rearview mirror. But for African-Americans, it’s worth remembering that Joseph and Lynn had a historic start.